Helps prevents dryness for 12 hours! Formulated with Fresh Water complex so color stays true. My routine starts at 9 30 AM and ends at 10 PM on working days. So 'Long lasting' is the first thing I check in most of my cosmetics. So, when I read all these claims I obviously had to get it. Texture: Feather-light lipstick which glides on lips giving a smooth finish on well moisturised lips else gives an untidy finish. Package: Sleek and classy packaging. Not so sturdy but manageable. Fragrance: Mild pleasant fragrance observed when smelled from package but on lips it's odourless. Shade: Forever Burgundy. As 'Long Lasting' in my life means 'For Work' I was looking for a medium shaded lip color. This shade was shown in the catalogue as 'medium pinkish brown' but in reality it is a 'dark pinkish red'. So disappointed in-spite of the beautiful shade. Lasting Power: Totally amazed as it stays for 5-6 hours without meals. With meals it leaves a lovely pink stain. Transfer Resistant? NO for cups and YES on skin. Bleeding? 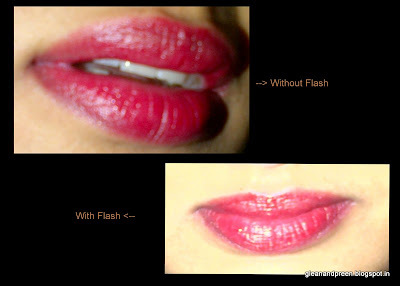 It bleeds meaning you have to either use a lip liner or be extremely careful while applying at the boundaries of your lips. For opaque color that lasts long. For the adorable stained lips. For the dark shade which instantly brightens the face. For settling in fine lines. Dear Readers: Let me know your opinion about "Avon ExtraLasting Lipstick" in the 'Will You Buy It' section and share your feedback about the review through comments. i hv this in Mauve ice shade... lucky tat it almost looked the same in the catalogue & product too.. i can understand how much it irritates when wat you get is not wat you see.. hv experienced the same before..